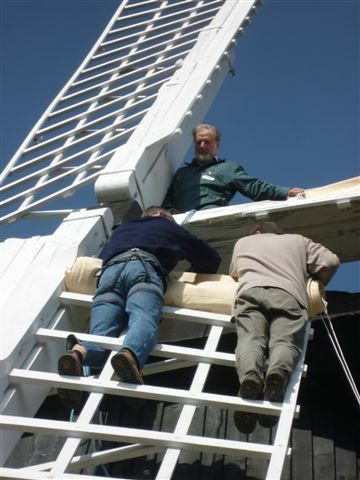 In March 2010 Wheatley Windmill Restoration Society became Wheatley Windmill Preservation Society as restoration work is more or less complete. 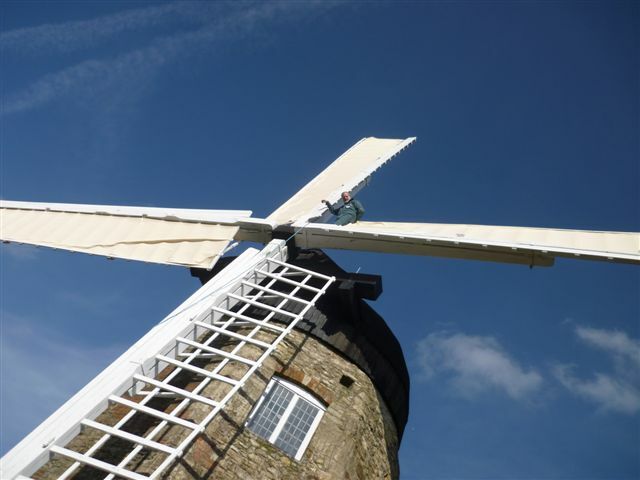 Now the emphasis is on maintaining the mill and occasional milling of Wheatley Flour. 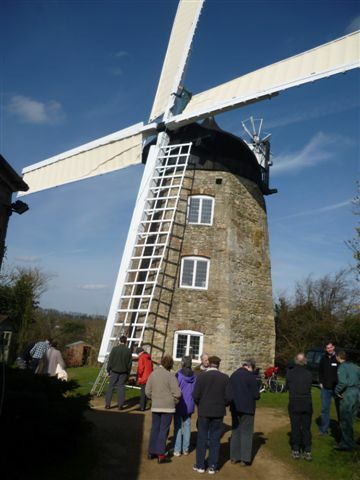 With this aim in mind 16 volunteers met on the 12th of March 2011 to learn how to operate the mill and put the sail cloths up and down. As with so many volunteer projects there were people from many walks of life: several engineers, an archaeologist, a chartered surveyor, an aid worker, a librarian, a gardener, a chiropractor, among others. The volunteers went inside the cap and learned how to put the brake on and off. The cap, which is usually turning so that the sails are facing into the wind, must be stopped in order to put on the sail cloths. The volunteers learned how to tie and release the fan tail – the small wheel at the back of the cap which is responsible for turning the sails into the wind. When the fan tail has been tied and the brake has been put on everything is ready for the sail cloths to be put onto the sail frames. Seven of our intrepid volunteers were prepared to do this. 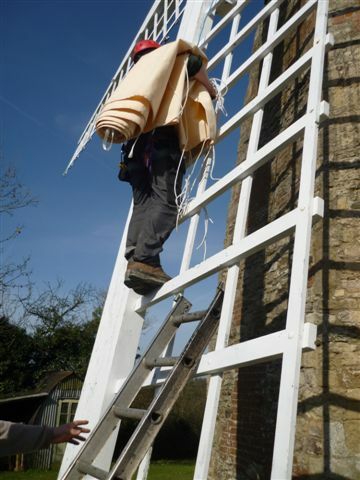 Each volunteer had to climb to the top of the sail frame with a canvas over his shoulder and tie the canvas securely onto the frame. After each sail cloth was tied on the brake had to be released in order to turn the sails ¼ turn so the next sail cloth could be attached. It was very good practice for those who were learning how to put the brake on and off. Just as the last sail cloth went up the slight breeze got up and we were able to engage the fan tail, release the brake, push the sails to get started, and happily watch the sails whizzing around. The next task will be engaging the mill stones and milling flour. Further training days are likely to take place on a Saturday by arrangement. They will be in addition to the normal opening times – the second Sunday afternoons from May to October. If you are interested in being part of this small dedicated group of volunteers we would love to hear from you. People are needed to serve teas and cakes as well as the more technical jobs, and painting and oiling the woodwork will be on-going projects. If you are interested please contact Sally Humphrey or Caroline Dalton by email at secretary@wheatleymill.co.uk.